South Africa, 16th July 2015—A new study finds there is little evidence that the Lion bone trade in South Africa is currently adversely impacting wild Lion populations there, but warns the situation needs to be closely monitored and that too little is known about the situation elsewhere in Africa. 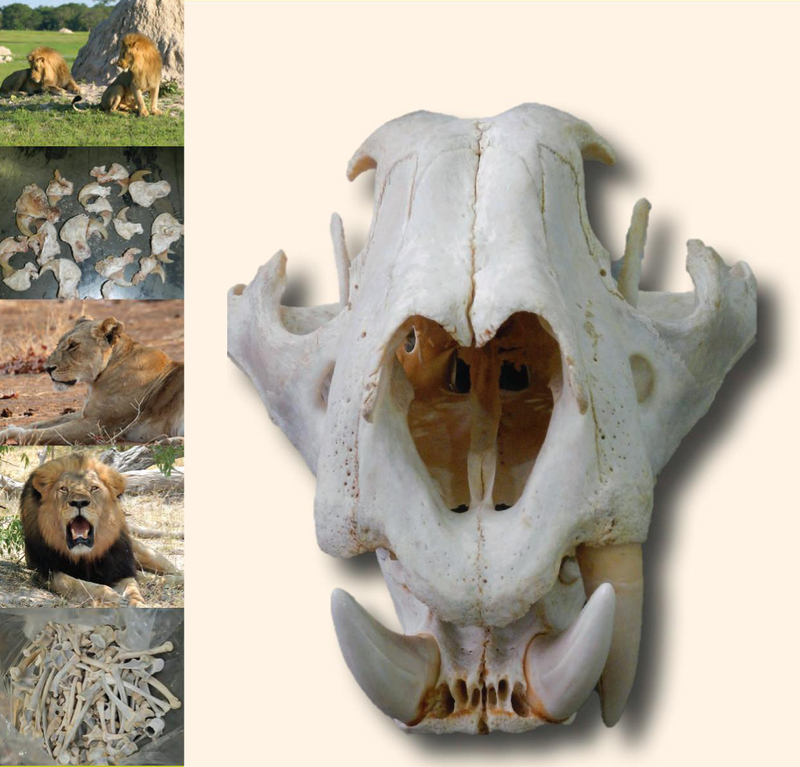 The findings, by researchers from Oxford University’s Wildlife Conservation Research Unit (WildCru), TRAFFIC and the University of Witwatersrand, were published today in Bones of Contention: An assessment of the South African trade in African Lion bones and other body parts (PDF, 5 MB). Lions are listed in Appendix II of CITES (the Convention on International Trade in Endangered Species of Wild Fauna and Flora), which means international trade in live animals or body parts can only take place under a strictly controlled permit system. Prior to 2008, the only record of South Africa issuing CITES permits to export Lion skeletons was for three units to Denmark in 2001. However, Lion bone exports from South Africa have increased dramatically in recent years. From 2008 to 2011, the official number of skeletons legally exported with CITES permits totalled 1160 skeletons (about 10.8 tonnes on bones), 573 of them in 2011 alone, with 91% of them destined for Lao PDR. The North West, Free State and Eastern Cape, all home almost exclusively to captive-bred Lions, were the only provinces to issue export permits. Not all Lion bone trade in South Africa has been legal, however. In 2009, a Vietnamese national was arrested and later deported for being in possession of Lion parts without permits, while in June 2011 two Thai men were arrested after being found with 59 Lions bones. Nevertheless, the value of bones generated as a secondary by-product of the trophy hunting industry has allegedly motivated farmers to dig up previously discarded carcasses originating from trophy hunts and captive mortalities and whereas female Lions formerly had little or no trophy hunting value to breeders, the emergence of a market for bones has generated a previously overlooked value. The authors recommend Lion breeding facilities are closely monitored to restrict opportunities for abuse of the system for financial gain. The authors speculate that bone exports to Asia may be connected to Lion bone being used as a substitute for Tiger bone in tonics. In 2005, TRAFFIC found evidence that African Lion bones were an ingredient in “tiger bone strengthening” wine produced in Guilin, China, and distributed in Tiger-shaped bottles, but with Lion bones as an approved ingredient. The authors also note the difficulty of distinguishing Lion from Tiger bones. With more than 280 Tigers captive in South Africa, they recommend DNA spot checks of shipments to verify their origin. The reports also notes the large discrepancies in information on Lions in South Africa: between 2004 and 2010, 2950 Lions were registered as having been hunted there – yet CITES export permits indicate 4088 trophies for the same period, a difference of more than 1100 trophies. Several reasons are proposed to explain the discrepancies, including specimens incorrectly described as trophies and animals not being hunted in the same year as the permits are issued. The authors recommend a number of improvements to recording systems, including development of an integrated national system for issuing permits that can be crosschecked by all enforcement and Customs officials. They also make a pragmatic blanket recommendation that measures currently in place to impede opportunities for illegal activities are strengthened across the entire supply chain from Lion breeding to skeleton exports.